Now that the summer scorchers are over, it’s time to bring in your window air conditioning units. While it’s tempting to just leave them hanging there, it’s never a good idea to go through heating season with a window wide open. 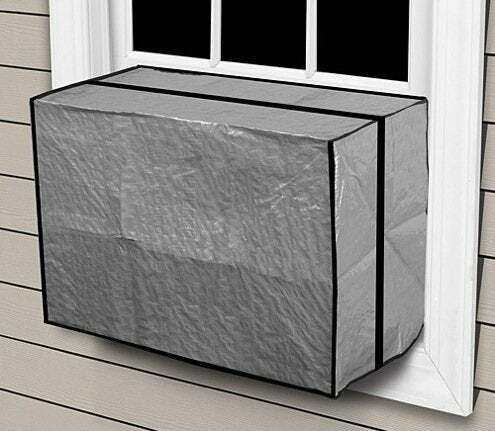 If for some reason the unit can’t be removed, seal the area around it as tightly as you can with a commercial cover… or you can make one from a water heater insulation jacket. Bigger AC units are heavy and you may need a hand to bring them in and store them safely; you don’t want to be the guy (or gal) who drops one on the sidewalk. It’ll be easier if you have a power drill driver for unfastening screws, and a box or bin to store the unit in with all its parts and hardware. Follow the manufacturer’s instructions (which you should also keep in the box) for cleaning and drying all the parts thoroughly, inspecting it for damage as you go. A fin comb is a great tool to have on hand to straighten out any bent fins that can compromise the unit’s performance. Cover it up, store it in a dry place, and your air conditioner will be ready when the dog days return!